Growth Habit: Yarrow is a common plant in English cottage-style gardens. It has however escaped cultivation and now forms significant weedy infestations on roadsides, turf and pasture areas. 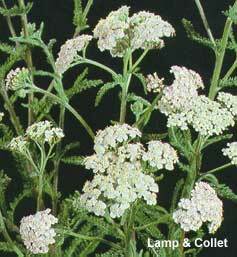 Yarrow has also been used medicinally due to it containing ethereal oils and small quantities of furocoumarin. Type of Plant: Yarrow is an erect perennial herb with soft, fern-like, aromatic foliage. It has creeping underground stems. Flowers: Five petalled white or pale pink flowers. The plant has many flowers that are located in attractive tight clumps mainly at the top of the plant. Yarrow flowers in summer and autumn. Fruit/Seed: A single plant can produce large quantities of seeds due to the abundant flowers. Dispersal: Yarrow reproduces by seed and by its underground stems. Distribution: A garden escape which can be found on roadsides, neglected gardens and wastelands. Yarrow can cause skin irritation if juice is left on the skin and then exposed to the sun. Once established in grassed areas, such as home lawns or pasture, it can be difficult to eradicate. Grubbing (spring and summer). The flower heads should be removed before seeding and destroyed. Manual removal of the plant is effective as long as its creeping root system is also removed. Dispose of the material carefully, as the root system can regrow. Herbicide. Spot spray. Herbicides registered in Tasmania include MCPA and glyphosate.